For an ancient Egyptian, entertainment eases up a day's worth of hard work. Egyptians must unwind themselves especially for the poorer classes. The poorer you are, the more you have to break your back! If you would examine their own pastimes, you may be surprised that they have similar pastimes compared to us. They don't have computers or TVs to brag about. Telling stories, playing sports, and throwing a party does the job pretty well especially in ancient times! One of the most common sports during that time came from the military. Although aimed for soldiers, Egyptians seeking to improve their physical attributes use them for training purposes. For nobles and other elite members of the society, they drive themselves nuts with chariots and kill their time by hunting wildlife. Before engaging in a battlefield, everyone trains on a safe environment. For charioting, they made a large place for them to run their chariots and shoot arrows on copper targets while moving. On the other hand, to make hunting safe, they made a huge pen similar to a national wild park, and they fill it with bunch of gazelles, deer and bulls. Remember, this is not meant to be as a conservation park but rather as a hunting park! A board game works just fine if you lack the physical skills of hunting or charioting. Sadly the rules of the board games found on excavation didn't survive. However, individuals with high creativity thought of rules applicable on these games. Story telling holds the title for the best past time for most Egyptians. This form of ancient Egyptian entertainment can draw crowds for a good amount of time. Egyptians commonly cannot read and write. No problem! Stories are passed orally. They tell popular stories and modify it according to their interests, objective and audiences. For a child to listen to a story, they should tone it down a little bit to digest the story easily. Almost all of these tales vanished in the sand. Luckily for us, some scribes thought of recording the most prominent tales of Egypt for future references. We too, can enjoy these stories at our finger tips! 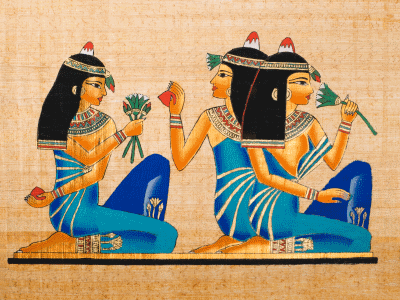 Partying completes the long list of ancient Egyptian entertainment. Throwing a party during those times mimics the ones we have for today with a few modifications. Although no records identified how the poor mass enjoys party on festivals, elites left vivid records on how they did it.